Here is another version of a chestnut spice latte. If you cannot find sweet chestnuts, you can use baked sweet potatoes or Hokaido pumpkins as a replacement in this recipe. They work just fine. This drink is very filling so it can replace a dessert or a snack. 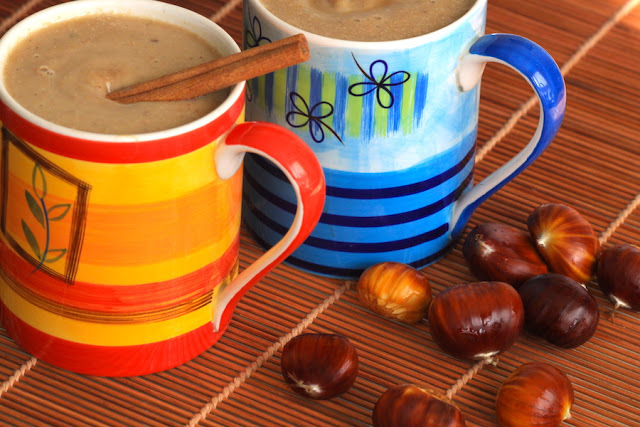 Mix the cooked and peeled chestnuts with all the other ingredients until smooth and bring the liquid to a quick boil over medium-heat until the chestnut and milk become thickened. If too thick, add more milk. Serve immediately. There is no problem if you don't have all these spices at home. It works fine sometimes only with cinnamon, cardamom and orange compote for instance. 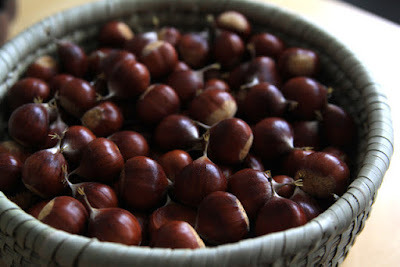 If you have harvested/foraged your chestnuts fresh and need to learn how to prepare them, please check out this other post.